The city of Ithaca is a city in central New York and the county seat of Tompkins County, as well as the largest community in the Ithaca-Tompkins County metropolitan area (which also contains the separate municipalities of the town of Ithaca, the village of Cayuga Heights, the village of Lansing and other towns and villages in Tompkins County). The city of Ithaca sits on the southern shore of Cayuga Lake, in Central New York. It is named for the Greek island of Ithaca. Ithaca is home to Cornell University, an Ivy League school of over 20,000 students, most of whom study on Cornell’s Ithaca campus. Ithaca College is located just south of the city in the town of Ithaca, adding to Ithaca’s "college town" focus and atmosphere. Nearby is Tompkins Cortland Community College (TC3). These three colleges influence Ithaca's seasonal population. In 2010, the city's population was 30,014, and the metropolitan area had a population of 101,564. The inhabitants of the Ithaca area at the time Europeans began arriving were the Iroquois confederation power opened the region to settlement by people of European origin, a process which began in 1789. In 1790, an official program began for distributing land in the area as a reward for service to the American soldiers of the Revolutionary War; most local land titles trace back to the Revolutionary war grants. Lots were drawn in 1791; informal settlement had already started. As part of this process, the Town of Ulysses, the Latin form of the Greek Odysseus from Homer's Odyssey. A few years later DeWitt moved to Ithaca, then called variously "The Flats," "The City," or "Sodom," and named it for the Greek island home of Ulysses (still the surrounding township at the time — nowadays Ulysses is a separate town in Tompkins County). Contrary to popular myth, DeWitt did not name many of the classical references found in Upstate New York such as Syracuse and Troy; these were from the general classical fervor of the times. A view of the shops and businesses on the Ithaca Commons. In the 1820s and 1830, Ithaca held high hopes of becoming a major city when the South Hill Recreation Way. However, easier routes soon became available, such as the Syracuse, Binghamton & New York (1854). In the decade following the Civil War railroads were built from Ithaca to surrounding points (Geneva, New York; Cayuga, New York; Cortland, New York; Elmira, New York; Athens, Pennsylvania) mainly with financing from Ezra Cornell. However, the geography of the city has always prevented it from lying on a major transportation artery. When the Lehigh Valley Railroad built its main line from Pennsylvania to Buffalo in 1890 it bypassed Ithaca (running via eastern Schuyler County on easier grades), as the Delaware, Lackawanna and Western Railroad had done in the 1850s. 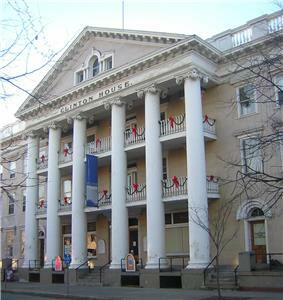 The late nineteenth century gave birth to the two major postsecondary educational institutions Ithaca has today. In 1865, Ezra Cornell founded Cornell University. It was opened as a coeducational institution. Women first enrolled in 1870. Ezra Cornell also established a public library for the city. Ithaca College was founded as the Ithaca Conservatory of Music in 1892. Ithaca College was originally located in the downtown area, but relocated to South Hill in the 1960s. 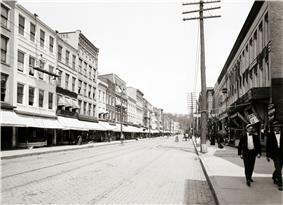 Ithaca became a city in 1888 and became a small manufacturing and retail center. The Lansing, New York. After World War II, National Cash Register and the Langmuir Research Labs of General Electric were also major employers. During the early 20th century, Ithaca was an important center in the silent film industry. These films often featured the local natural scenery. Many of these films were the work of Leopold Wharton and his brother Theodore Wharton in their studio on the site of what is now Stewart Park. After the film industry centralized in Hollywood, production in Ithaca effectively ceased. Few of the silent films made in Ithaca are preserved today. 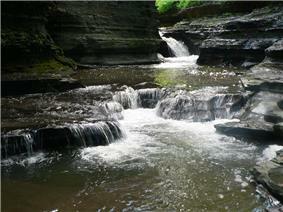 Hemlock Gorge along Fall Creek before emptying into Beebe Lake on Cornell's campus. Ithaca was founded on flat land just south of the lake — land that formed in fairly recent geological times when silt filled the southern end of the lake. The city ultimately spread to the adjacent hillsides, which rise several hundred feet above the central flats: East Hill, West Hill, and South Hill. Its sides are fairly steep, and a number of the streams that flow into the valley from east or west have cut deep canyons, usually with several waterfalls. Due to the microclimates created by the impact of the lakes, the region surrounding Ithaca (Finger Lakes American Viticultural Area) experiences a short but adequate growing season for winemaking. As such the region is home to many wineries. Ithaca is a major educational center in Central New York. The city is home to Cornell University which overlooks the town from East Hill, and Ithaca College, situated on South Hill. The two schools bring a substantial student population, with about 21,000 students enrolled at Cornell and about 6,400 at Ithaca College. Tompkins Cortland Community College is located in the neighboring town of Dryden, New York, and has an extension center in downtown Ithaca. Empire State College offers non-traditional college courses to adults in downtown Ithaca. The Ithaca City School District, which encompasses Ithaca and the surrounding area, enrolls about 5,500 K-12 students in eight elementary schools, two middle schools, Ithaca High School, and the Lehman Alternative Community School. There are also several private elementary and secondary schools in the Ithaca area, including Immaculate Conception School, the Cascadilla School, the New Roots Charter School, the Elizabeth Ann Clune Montessori School, and the Ithaca Waldorf School. Ithaca has two networks for supporting its home-schooling families: Loving Education At Home (LEAH) and the Northern Light Learning Center (NLLC). Ithaca draws students from around the United States and the rest of the world with its various vocational schools and specialty institutes, such as the 1000-hour program at the Finger Lakes School of Massage. Ithaca's Suzuki school, Ithaca Talent Education, provides musical training for children of all ages and also teacher training for undergraduate and graduate-level students. The Community School of Music and Art uses an extensive scholarship system to offer classes and lessons to any student, regardless of age, background, economic status or artistic ability. The economy of Ithaca is based on education and manufacturing with high tech and tourism in strong supporting roles. As of 2006, Ithaca remains one of the few expanding economies in economically troubled New York State outside of New York City, and draws commuters from the neighboring rural counties of Cortland, Tioga, and Schuyler, as well as from the more urbanized Chemung County. With some level of success, Ithaca has tried to maintain a traditional downtown shopping area that includes the Ithaca Commons pedestrian mall and Center Ithaca, a small mixed-use complex built at the end of the urban renewal era. Another commercial center, Collegetown, is located next to the Cornell campus. It features a number of restaurants, shops, and bars, and an increasing number of high rise apartments and is primarily frequented by Cornell University students. Ithaca has many of the businesses characteristic of small American university towns: used bookstores, art house cinemas, craft stores, and vegetarian-friendly restaurants. The collective Moosewood Restaurant, founded in 1973, was the wellspring for a number of vegetarian cookbooks; Bon Appetit magazine ranked it among the thirteen most influential restaurants of the 20th century. Ithaca has many local restaurants and chains both in the city and town with a range of ethnic foods. The innovative and popular Ithaca Bakery chain, and the Ithaca Farmers Market also provide a range of foods. 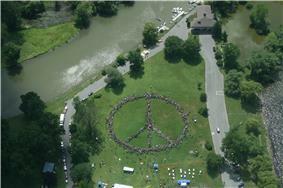 An aerial view of Stewart Park as 6,000 Ithaca residents set the unofficial world record for the largest human peace sign in June, 2008. 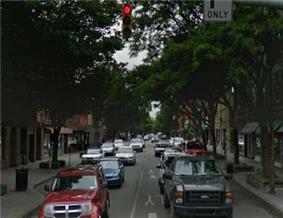 Cayuga Street at Green Street in downtown Ithaca. Ithacans support the Ithaca Farmers Market, professional theaters (Kitchen Theatre Company, Hangar Theatre, Icarus Theatre), a civic orchestra, much parkland, the Sciencenter, a hands-on science museum for people of all ages, an independent movie theater (Cinemapolis), and the Museum of the Earth. Ithaca is noted for its annual artistic celebration of community: The Ithaca Festival (and its parade), the Circus Eccentrithaca. The Constance Saltonstall Foundation for the Arts provides grants and Summer Fellowships at the Saltonstall Arts Colony for New York State artists and writers. Ithaca also hosts what is described as the third-largest used-book sale in the United States. Other festivals occur annually, usually centered around food, music, and/or spirits. These include The Apple Festival in the fall, with many different varieties of apples and apple products; Chili Fest in February, a local contest involving many local restaurants who compete to make the best chili in several different categories; the Finger Lakes International Dragon Boat Festival in July; Porchfest in late September, which includes an eclectic mix of local musicians performing throughout the day on an array of porches in Fall Creek homes; and Ithaca Brew Fest in Stewart Park in September, usually featuring tastings of over 100 varieties of beer from regional, national, and international Craft brewers, food from local vendors, and music from local bands. Ithaca has also pioneered the Ithaca Health Fund, a popular cooperative health insurance. Ithaca is also home to one of the United States' first local currency systems, Ithaca Hours, developed by Paul Glover (building on the pioneering work of Ralph Borsodi and Robert Swann). It is claimed locally that in 1891, Rev. John M. Scott and a local druggist, Chester Platt, invented the ice cream sundae in Ithaca, though other cities make the same claim. The local Unitarian church, where Rev. Scott preached, has an annual "Sundae Sunday" every September in commemoration. Ithaca is known for its resident musicians, who contribute to a music scene which is unusually talented and diverse for such a small town. These musicians have come from many backgrounds to pursue their careers in Ithaca; the School of Music at Ithaca College attracts talented musicians, some of whom remain in Ithaca after graduating and take up work as performing musicians or in the sound engineering field. Ithaca is the seat of the Official Orchestra of the City of Ithaca, commonly known under the name Cayuga Chamber Orchestra. Several notable musicians have relocated from other countries to Ithaca in order to begin their careers, most notably Samite of Uganda, Mamadou Diabaté of Mali and Malang Jobateh of Senegal. Other regionally, nationally and internationally known performers and musical groups that call Ithaca home include: Donna the Buffalo, The Burns Sisters, jazz cellist Hank Roberts, Johnny Dowd, Jimkata, John Brown's Body, Ayurveda, The Gunpoets, The Blind Spots, The Sim Redmond Band, Nate & Kate, The Horse Flies, Technicolor Trailer Park, Mike Brindisi & The New York Rock, Who You Are, Willie B, Kevin Kinsella, and X Ambassadors. The Spin Doctors began their career in Ithaca. Traditional folk music is a staple and is featured weekly on North America's longest running live folk concert broadcast WVBR 93.5 FM's Bound for Glory. In the nearby village of Trumansburg, the Finger Lakes Grassroots Festival of Music and Dance is held every third week in July. Initiated as a benefit for Aids research at the State Theater in Ithaca by the band Donna the Buffalo, it has successfully occurred every year for the past 20 years. The Grassroots Festival has brought hundreds and hundreds of bands through the region, further enriching the local musical palate with every new introduction of musical style and culture. Several local bands call it home as either a figurative birthplace or a nurturing environment within which to develop new forms of music. Other notable local music festivals include the Ithaca Festival, Musefest, the Summertime Block Party, the Juneteenth Celebration and Rock the Arts. Ithaca is also home to several radio stations. WVBR 93.5 FM is associated with Cornell University in the sense that it is owned and predominantly staffed by an association composed of enrolled Cornell students; but it is an independent, financially self-supporting commercial station in the rock format playing a mix of modern and classic rock during the week and specialty shows on the weekend. WICB 91.7 FM is an award-winning, non-commercial, student-run station owned by Ithaca College. WPIE 1160 AM/107.1 FM "ESPN Ithaca" is a sports talk station locally owned by Taughannock Media with a transmitter in Trumansburg and translator in Ithaca. The Cayuga Radio Group, a subsidiary of Saga Communications, Inc., owns country WQNY "Q-Country" 103.7 FM, WYXL "Lite Rock" 97.3 FM, news/talk WHCU 870 AM, progressive talk WNYY 1470 AM, as well as classic rock "I-100" WIII 99.9 FM, with its main transmitter in Cortland and a repeating station at 100.3 FM in Ithaca. Saga also has lower-powered "translator" stations "Hits 103.3" and "98.7 The Vine" on the FM dial. WFIZ "Z95.5" is also in the area, broadcasting a top-40, CHR format. Classic rock "The Wall" WLLW 99.3 and 96.3, based in Seneca Falls, has a transmitter in Ithaca. There is also NPR and classical programming available on WSQG 90.9 FM, NPR/college programming on WEOS repeater 88.1 FM, and Christian music and talk Family Life Network on 88.9 FM. Politically, the city's population has a significant tilt toward  and 11% county-wide. In 2008, Barack Obama, running against New York State's Senator Hillary Clinton, won Tompkins County in the Democratic Presidential Primary, the only county that he won in New York State. Obama went on to win Tompkins County (including Ithaca) by a wide margin of 41% over his opponent John McCain in the November 2008 election. The name Ithaca designates two governmental entities in the area, the Town of Ithaca and the City of Ithaca. The Town of Ithaca is one of the nine towns comprising Tompkins County. (Towns in New York are something like townships in other states; every county outside New York City is subdivided into towns.) The City of Ithaca is surrounded by, but legally independent of, the Town. The Town of Ithaca contains the village of Cayuga Heights, a small incorporated upper-middle class suburb located to the northeast of the City of Ithaca. The City of Ithaca has a mayor-council government. The charter of the City of Ithaca provides for a full-time mayor and city judge, each independent and elected at large. Since 1995, the mayor has been elected to a four-year term, and since 1989, the city judge has been elected to a six-year term. Since 1983, the city has been divided into five wards, each electing two members to the city council, known as the Common Council, for staggered four-year terms. The Town government consists of an executive, the Town Supervisor, elected to a four-year term, and a Town Council of five members also elected for terms of four years. The majority of local property taxes are actually assessed by an entirely independent agency with entirely different borders, the Ithaca City School District. In December 2005, the City and Town governments began discussing opportunities for increased government consolidation, including the possibility of joining the two into a single entity. This topic had been previously discussed in 1963 and 1969. The possibility of consolidation is controversial for Town residents who could be forced to pay higher taxes as they help shoulder the higher debt burden that the City has taken on. Some Town residents also worry that consolidation could lead to increased sprawl and traffic congestion. However, most of the Town's population is already concentrated in hamlets in proximity to the City's borders and Town residents take advantage of City amenities. Mayor Walter Lynn of Cayuga Heights called consolidation discussion a "waste of time." In the city the population was spread out with 9.2% under the age of 18, 53.8% from 18 to 24, 20.1% from 25 to 44, 10.6% from 45 to 64, and 6.3% who were 65 years of age or older. The median age was 22 years. For every 100 females there were 102.6 males. For every 100 females age 18 and over, there were 102.2 males. Ithaca is in the rural Finger Lakes region about 225 miles to the northwest of New York City; the nearest larger cities, Binghamton and Syracuse, are an hour's drive away by car, Rochester and Scranton are two hours, Buffalo and Albany are three. New York City and Philadelphia are about four hours away. Cleveland, Boston, Washington DC, and Montreal are about five hours away. Ithaca is served by Ithaca Tompkins Regional Airport, located about three miles to the northeast of the city center. US Airways Express offers flights to its hub at Philadelphia using a mixture of small jets and propeller craft. Delta Air Lines provides thrice-daily jet service to its hub at Detroit Metro airport and United Express offers three daily turboprop flights to Newark Liberty International Airport. Some residents choose to travel to Syracuse Hancock International Airport, Greater Binghamton Airport, Elmira-Corning Regional Airport or Greater Rochester International Airport for more airline service options. Ithaca lies at over a half hour's drive from any interstate highway, and all car trips to Ithaca involve some driving on two-lane state rural highways. The city is at the convergence of many regional two-lane state highways: Routes 13, 13A, 34, 79, 89, 96, 96B, and 366. These are usually not congested except in Ithaca proper. However, Route 79 between the I-81 access at Whitney Point and Ithaca receives a significant amount of Ithaca-bound congestion right before Ithaca's colleges reopen after breaks. There is frequent intercity bus service by Greyhound Lines, New York Trailways, and Shortline (Coach USA), particularly to Binghamton and New York City, with limited service to Rochester, Buffalo and Syracuse, and (via connections in Binghamton) to Utica and Albany. The bus station serving all these companies is the former Delaware, Lackawanna & Western railway station on Meadow St. between W State and W Seneca streets, a little over half a mile west of downtown Ithaca. Cornell University runs a premium Campus to Campus bus between its Ithaca campus and its medical school in New York City which is open to the public. Ithaca is the center of an extensive bus public transportation network. TCAT, Inc (Tompkins Consolidated Area Transit, Inc.) is a not-for-profit corporation that provides public transportation for Tompkins County New York. TCAT was reorganized as a non-profit corporation in 2004 and is primarily supported locally by Cornell University, the City of Ithaca and Tompkins County. TCAT's ridership increased from 2.7 million in 2004 to 4.4 million in 2013. http://www.tcatbus.com/files/all/tcat_2013_yearbook_-_final.pdf TCAT operates 33 routes, many running seven days a week. It has frequent service to downtown, Cornell, Ithaca College, and the Shops at Ithaca Mall in the neighboring Town of Lansing, but less frequent service to many residential and rural areas, including Trumansburg and Newfield. Chemung County Transit ( C-TRAN) runs weekday commuter service from Chemung County to Ithaca. Cortland Transit runs commuter service to Cornell University. Tioga County Public Transit operates three routes to Ithaca and Cornell, but will cease operating on November 30, 2014. In July 2008, a non-profit called Ithaca Carshare began a Buffalo and Syracuse. Independent studies have shown that for each Ithaca Carshare vehicle in the fleet, 15 fewer personally owner cars are owned. Rideshare services to promote carpooling and vanpooling are operated by ZIMRIDE and VRIDE. A community mobility education program, Way2Go is operated by Cornell Cooperative Extension of Tompkins County. Way2Go's website provides consumer information and videos. Way2Go works collaboratively to help people save money, stress less, go green and improve mobility options. - See more at: http://ccetompkins.org/community/way2go#sthash.IocP71mT.dpuf The 2-1-1 Tompkins/Cortland Help line connects people with services, including transportation, in the community, by telephone and web on a 24/7 basis. The information and referral service is operated by the Human Services Coalition of Tompkins County, Inc. Together, 2-1-1 Information and Referral and Way2Go are a one-call, one-click resource designed to mobility services information for Ithaca and throughout Tompkins County. Norfolk Southern freight trains reach Ithaca from Sayre, Pennsylvania, mainly to deliver coal to AES Cayuga, a coal power plant (known as Milliken Station during NYSEG ownership) and haul out salt from the Cargill salt mine, both on the east shore of Cayuga Lake. There is no passenger rail service, although from the 1870s through the 1950s there were trains to Buffalo via Geneva, New York; to New York City via Wilkes-Barre, Pennsylvania (Lehigh Valley Railroad) and Scranton, Pennsylvania (DL&W); to Auburn, New York; and to the US northeast via Cortland, New York; service to Buffalo and New York City lasted until 1961. The Lehigh Valley's top New York City-Ithaca-Buffalo passenger train, "The Black Diamond", was optimistically publicized as 'The Handsomest Train in the World', perhaps to compensate for its roundabout route to Buffalo. It was named after the railroad's largest commodity, anthracite coal. Ithaca was the fourth community in New York state with a street railway; streetcars ran from 1887 to summer 1935. For decades, the Ithaca Gun Company tested their shotguns behind the plant on Lake Street; the shot fell into Fall Creek (a tributary of Cayuga Lake) right at the base of Ithaca Falls. A major clean-up effort sponsored by the United States Superfund took place from 2002 to 2004. After many years of debate and environmental concerns, the old Ithaca Gun building has been dismantled and is scheduled to be replaced by an apartment complex. The former Morse Chain company factory on South Hill, now owned by Emerson Power Transmission, was the site of extensive groundwater and soil contamination. Emerson Power Transmission has been working with the state and South Hill residents to determine the extent and danger of the contamination and aid in cleanup. Ithaca was also ranked 13th among America's Best College Towns by Travel + Leisure in 2013 and ranked as the #1 Best College Town in America in the American Institute for Economic Research's 2013-2014 College Destination Index. In its earliest years during frontier days, what is now Ithaca was briefly known by the names "The Flats" and "Sodom," the name of the Biblical city of sin, due to its reputation as a town of "notorious immorality", a place of horse racing, gambling, profanity, Sabbath breaking, and readily available liquor. These names did not last long; Simeon DeWitt renamed the town Ithaca in the early 19th century, though nearby Robert H. Treman State Park still contains Lucifer Falls. 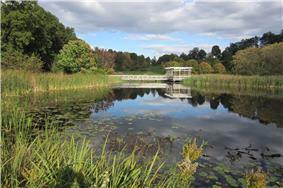 For additional information about recreational trails see: Trails in Ithaca, New York. Being Human — Main character Josh Levinson is from Ithaca and returns in episode 107 "I See Your True Colors... And That's Why I Hate You"
See also The Whartons Studio for films shot in Ithaca prior to 1920. ^ "2007–08 facts" (PDF). Cornell University. Retrieved 2007-08-16. ^ "Welcome to Namgyal! Namgyal Monastery in Ithaca, New York, is the North American Seat of His Holiness the 14th Dalai Lama. Open to all, Namgyal offers authentic teachings of Tibetan Buddhism in a traditional monastic setting.". Namgyal Monastery. 2007. Retrieved 2007-08-16. ^ "NowData - NOAA Online Weather Data". NOAA. Retrieved 2011-12-14. ^ "Winter Weather". TompkinsREADY. Retrieved 2010-12-30. ^ "ITHACA CORNELL UNIV, NEW YORK – Climate Summary". ^ "Ithaca Farmers Market". Ithacamarket.com. 2009-05-16. Retrieved 2010-12-30. ^ "Home". ithacabrewfest.com. Retrieved 2013-02-26. ^ "Two Rivers – The REAL Birthplace of the Ice Cream Sundae". Two Rivers Economic Development. Retrieved 2007-06-26. ^ Harlin, Kevin (2000-11-09). "Tompkins Greens express no regrets". ^ Ithaca Times – A Greater Ithaca? ^ METROPOLITAN STATISTICAL AREAS AND COMPONENTS, Office of Management and Budget, 2007-05-11. Retrieved 2008-08-01. ^ MICROPOLITAN STATISTICAL AREAS AND COMPONENTS, Office of Management and Budget, 2007-05-11. Retrieved 2008-08-01. ^ COMBINED STATISTICAL AREAS AND COMPONENT CORE BASED STATISTICAL AREAS, Office of Management and Budget, 2007-05-11. Retrieved 2008-08-01. ^ "Public Meeting – Emerson Power Transmission Environmental Investigation", New York State Department of Environmental Conservation. June 22, 2005. Retrieved December 6, 2008. ^ Relocate-America.com, "Relocate-America.com's 2006 list of America's TOP 100 Places to Live." Available online . Retrieved 4 April 2006. 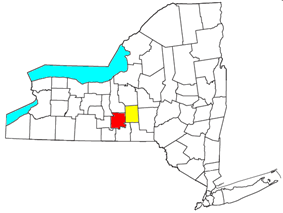 ^ Dr. James Sullivan, "The History of New York State", Book VII: "The Finger Lakes Region", Chapter VII: Tompkins County. Lewis Historical Publishing Company, Inc. (1927) Last Accessed on March 25, 2006. Ithaca, New York, United States, National Collegiate Athletic Association, Cornell University, Washington, D.C.